Creating Revolutionary Playground Solutions with Innovative Designs, Uncompromising Safety and Highest Quality Standards at Unbeatable Prices! Are you tired of overpriced playground equipment? You want to add playground solutions at your facility but are afraid your space is too small? Do the kids find their current playground equipment boring? So, email or call us today to receive information from our playground specialists and they will visit your facility to suggest the best equipment…Hassle Free. You can also browse through our website and view amazing designs now! Contact us Today to receive a $500 voucher on your playground purchase with us! We are sure we can build a playground solution to fit your needs and budget. So much so, fill out the form below to receive 50% OFF pricing along with a free design and estimate. 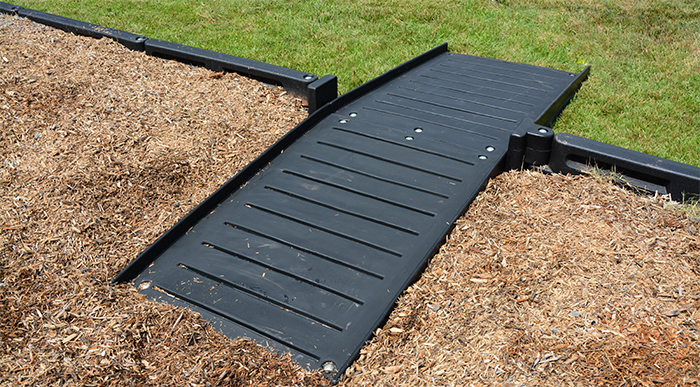 Funtimbers™ by Childforms® are the original, industry leading solution for playground construction and surface retaining. Funtimbers™ offers the most affordable and easy to install playground border on the market today. Each border ships our patented snap-in spike attached and ready for use. This allows for easy installation saving you and your organization valuable time and money. Childforms® Adjustable End Kit gives a clean, finished appearance. The Adjustable End Kit System for Funtimbers™ is the perfect solution for irregular areas like fences or existing walls. You get a clean, finished appearance that fits exactly into the area you want. The Adjustable End Kit comes with two (2) Adjustable Ends and two (2) Filler Ends. To use, simply cut the existing Funtimbers™ to the desired length and insert the Adjustable End. Adjustable End Kits – $175 comes with two (2) Adjustable Ends and two (2) Filler Ends.